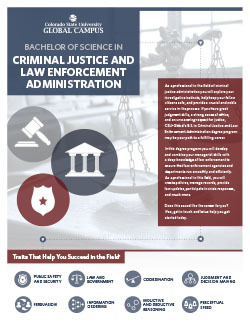 The degree in Criminal Justice and Law Enforcement Administration provides an advanced knowledge of trends and developments in the management of criminal justice organizations. These online criminal justice courses offer leadership, critical thinking, and effective decision making required in organizations including law enforcement, corrections, court, and community-based justice delivery offices. The accredited online criminal justice degree program provides knowledge and tools to students who want to advance professionally into leadership and management roles in criminal justice organizations. Classes in this program focus on criminology, law enforcement, juvenile justice, corrections, and research methods specifically oriented toward criminal justice professionals. Develop and apply basic statistical skills and quantitative reasoning for critical evaluation of quantitative information. Understand the roles, functions, and impacts of an effective criminal justice system. Examine ethical standards and issues in criminal justice processes and in professional decision making including the ever-present tension between effective crime control and appropriate civil liberties. Survey a range of theoretical approached that explain crime and apply theoretical reasoning and concepts to observations of crime and control. Analyze, from a restorative justice perspective, the needs of victims and offenders as well as the involved community as an alternative to satisfying abstract legal principals or punishing the offender. Appreciate the investigative profession as a scientific field; sample and apply physical science methods to solve forensic problems. You can customize your online degree in criminal justice and law enforecement administration by adding a specialization. Similar to a degree concentration, each specialization consists of five upper-division courses (15 credit hours) in a more specific area of interest. A specialization is not required to complete a bachelor’s degree, but it is an ideal way to tailor your educational experience to your professional goals and personal interests. CSU-Global’s accredited online bachelor’s degree in criminal justice and law enforcement administration is designed to provide you with a practical knowledge of the law enforcement field. The program consists of 10 three-credit core courses as part of a full 120-credit bachelor’s degree. Maximize your transfer credits and take advantage of our alternative credit options to finish faster and for less! "CSU-Global is the best choice I have made in regards to my education. I have attended several other online colleges and never seemed to feel like they really cared about me as a student. 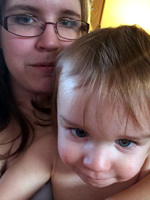 Here at CSU-Global they work with me if I am having a hard time getting financials together for books or classes."